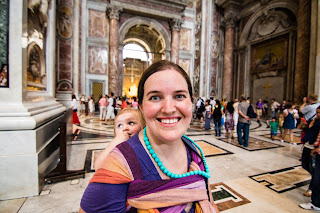 Image description: A dark haired woman wears a smiling baby on her back in a woven wrap. She is holding a light blue parasol over her shoulder to shade them. They stand in front of the Coliseum in Rome. The photo has a thin light green frame around it and the title "Babywearing and Air Travel" at the top. 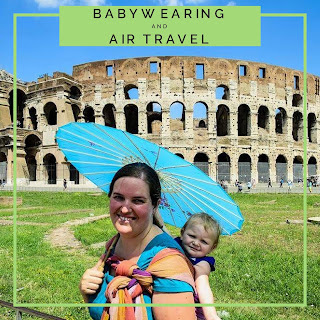 Babywearing while flying is a lifesaver! When you arrive at the airport in your chauffeured luxury car, simply put your baby securely into the carrier of your choice. Make sure the airport staff have retrieved all your luggage from the car. 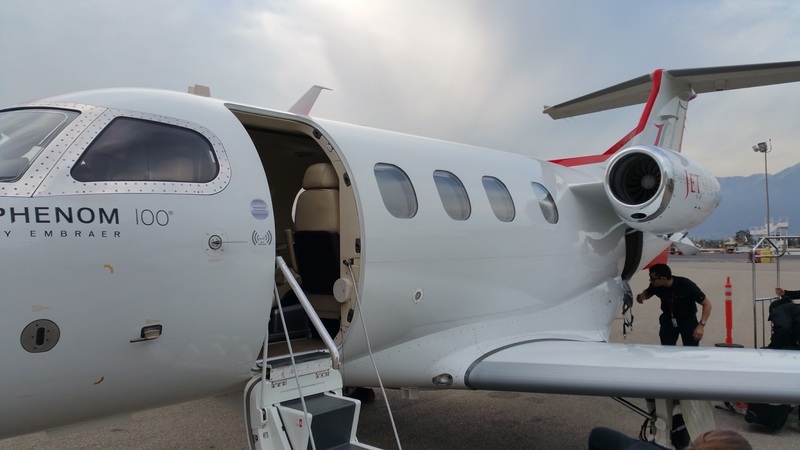 Walk across the tarmac and board your private jet. Make sure you don't bump baby's head as you climb aboard. Sit back, relax, and enjoy your cool beverage as your plane takes you towards the tropical beach paradise you've booked for your time off. Image description: A small white jet sits on a runway with the door open. A cloudy sky is visible in the background. Wait… What? That's not what your airplane experience will be like? Don't worry, it's not like that for the vast majority of travelers, and I've got a collection of tried and true tips and advice here for you. Image description: A light skinned, dark haired woman is smiling and wearing a woven wrap with a baby on her back. They are in a grand room with ornate marble floors and walls visible in the background. 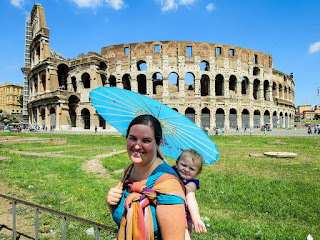 I’ve traveled extensively with my daughter since she was born 4 years ago, both around the United States and the world. My son has been on a few flights since he was born 5 months ago, and we’re going on a big international trip this summer, as well! 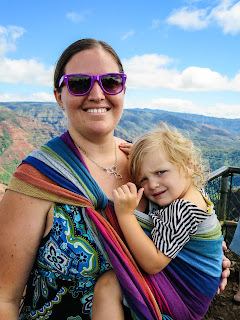 I’m going to answer the most common questions I get about babywearing and travel below. Even with my experience, please read this with the caveat that airports and security can (and do!) change policies at any time. Image description: A dark haired woman is wearing a black Meh Dai with a floral design. A blonde baby head is visible over the top of the carrier. The woman is sitting at a table holding a fork and knife. She has a meal and drink on the table and a suitcase next to her. Which carrier is best for travel? The best carrier for travel is whichever carrier you are most comfortable using! If you find wraps comfortable and easy to use, then you should bring a wrap. If you always grab your Soft Structured Carrier (SSC) when you’re looking for convenience, bring that. Keep in mind that you’ll probably need a free hand to pull a suitcase or push a stroller. Also keep in mind that carriers with metal (like most ring slings) will set off alarms in the metal detector. Image description: A dark haired woman stands on an airplane. She is leaning forward and untying the waist knot of a woven wrap. Her baby is resting on her back in the wrap. Another passenger is seated behind them. Can I wear baby through security? Usually, yes. In the 60+ flights I have taken while wearing a baby, I have only been told to remove my baby in international airports. The airports in the USA have typically had me walk through the metal detector and then swabbed my hands. I have heard reports of other people needing to remove baby in US airports, so your experience may vary. Security procedures can change at a moment’s notice so be calm and follow instructions. Image description: A close up photo of a dark haired woman on an airplane. 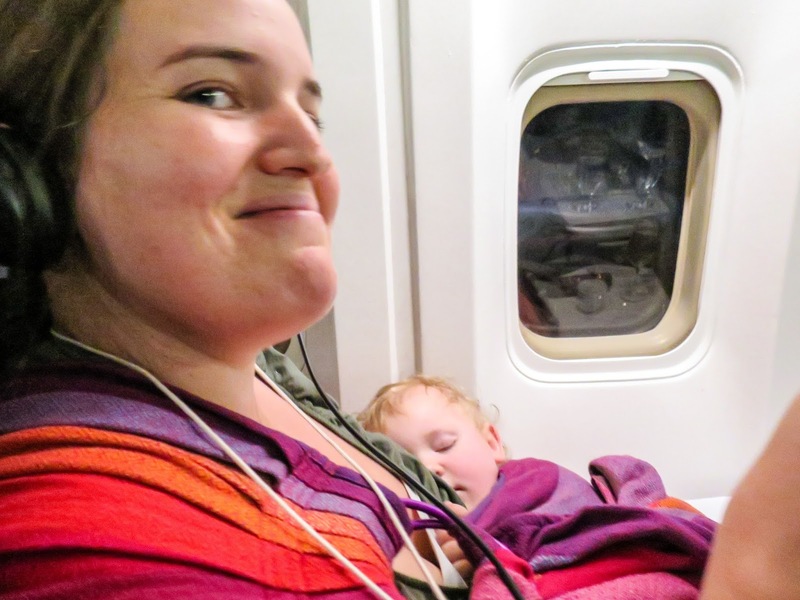 She is sitting next to an airplane window and wearing a sleeping child in a sling. The woman is smiling. Can I babywear on the flight? 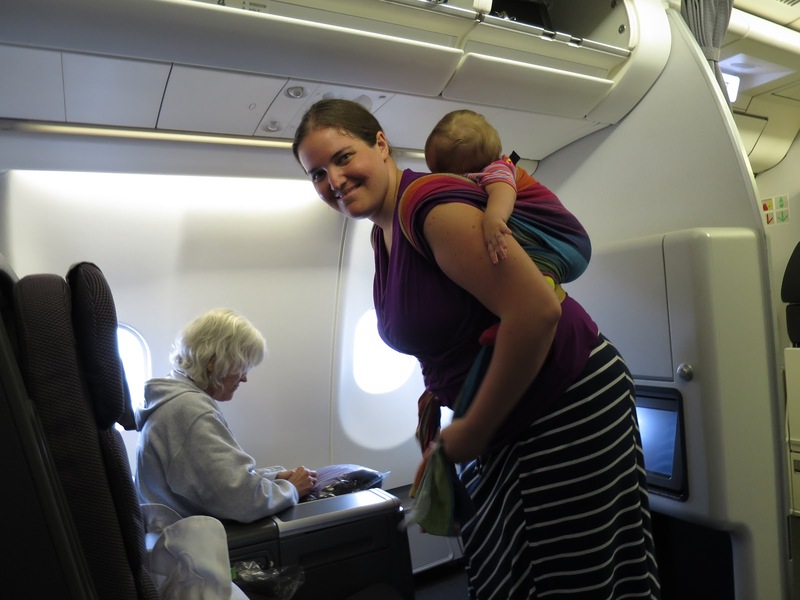 You can wear baby during the middle of the flight, but probably not during takeoff and landing. Flight attendants are trained to only allow FAA approved restraint devices to be used during these times. Approved restraints include many car seats, the belts on the airplane, and CARES harnesses, but not baby carriers. So expect to be asked to remove your baby carrier for takeoff and landing. Some flight attendants will be ok with you unclipping the chest clip or sliding the straps down your arms. Some will prefer to see the carrier entirely removed. My personal favorite carrier for flights is a ring sling because there is no knot or buckle on my back and I can adjust easily while seated. 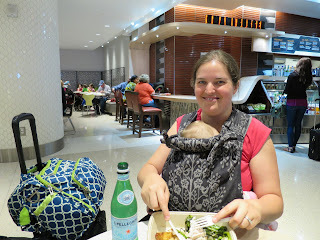 I often wear a wrap through security and the airport and then switch to a ring sling when I board the plane. Image description: A dark haired woman wears a blond curly haired toddler in a rainbow striped woven wrap. They are standing in front of a green canyon view with blue sky and fluffy white clouds. Should I bring a stroller, too? I don’t like to bring a stroller through the airport, but other people really love to bring theirs along. I don’t like to unload it to put all my stuff through security, fold it, go through security, open it, and load up my stuff again. I don’t like navigating through crowded terminals and stores with it, and I don’t like folding it in a hurry to gate check while still having to hold my child and belongings. I have heard from other people who love bringing their stroller to cart their stuff around, so it’s really up to you. Image description: A dark haired woman is standing on a subway, holding on to a handle. Her baby is on her back in a woven wrap, and has a hand up holding on to a handle, as well. The strap of her diaper bag is visible over her shoulder. How do I carry my other stuff? My preferred method is to wear baby and then bring a small cross body diaper bag. If I want to avoid checking bags or prefer to bring more on the plane, I like to put everything into a small rolling carry-on bag. If you’re bringing a carseat on the plane, look for a strap system where you can attach the seat to your carry on bag. Experiment a little. Lay out everything you want to bring, then try it in different bags until you find something that is going to be easy and comfortable for you to use while carrying a baby. Image description: A smiling dark haired woman stands in the middle of a crowded marketplace. She is wearing a turquoise ring sling which holds a baby upright on her chest. There are smiling people around them looking at the baby and colorful umbrellas over their heads. Will I be allowed to babywear everywhere I go? 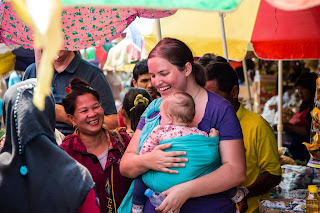 Babywearing will help you make friends wherever you go. I get a ton of positive comments and happy reactions. My children feel more secure meeting new people and having new experiences when they are safely in a carrier. It is much easier to get through crowds and around cultural sites with a carrier instead of a bulky stroller that needs a ramp or smooth ground. In general, people love to be helpful when they see babies. I often have people offering to help with my belongings in the airport! Some destinations, especially museums, might have insurance rules that prohibit babies in back carriers, so be prepared to be friendly and follow the rules you encounter. 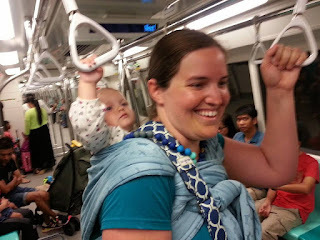 Image description: A dark haired woman wears a baby in a turquoise ring sling. She is standing next to another dark haired woman who is much shorter than her. She wears a baby in a yellow ring sling and is reaching out her hand to the first woman's baby. They are standing on the patio of a brick home. I know travel days can be very stressful, but try to relax and enjoy the adventure. 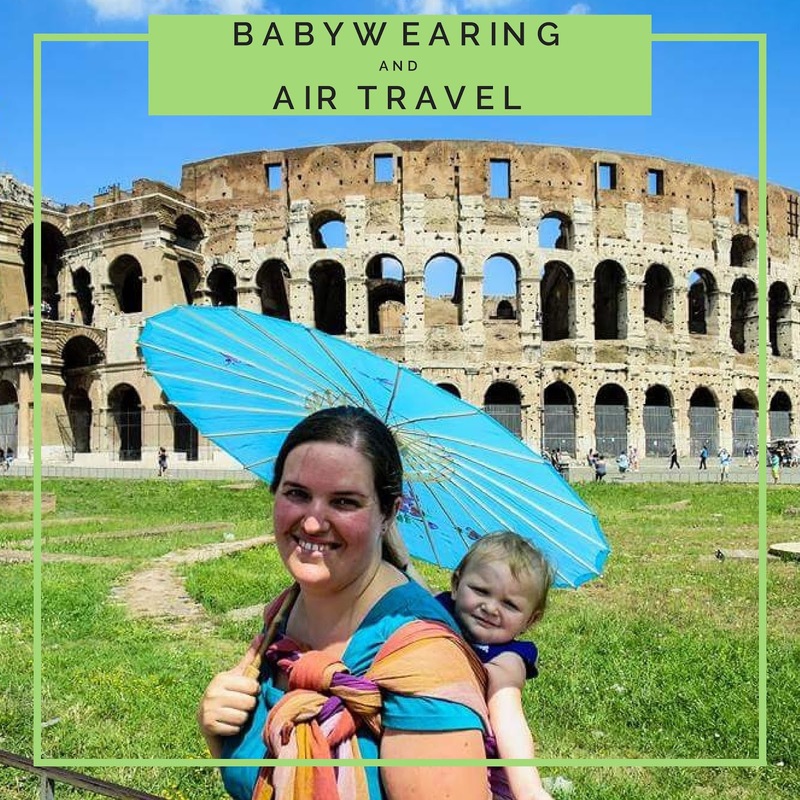 You are taking your baby on a trip, and even though it can be difficult at times, you are giving them experiences they just can't get at home. Safe travels! Our contributing author is Lauren Maynard. 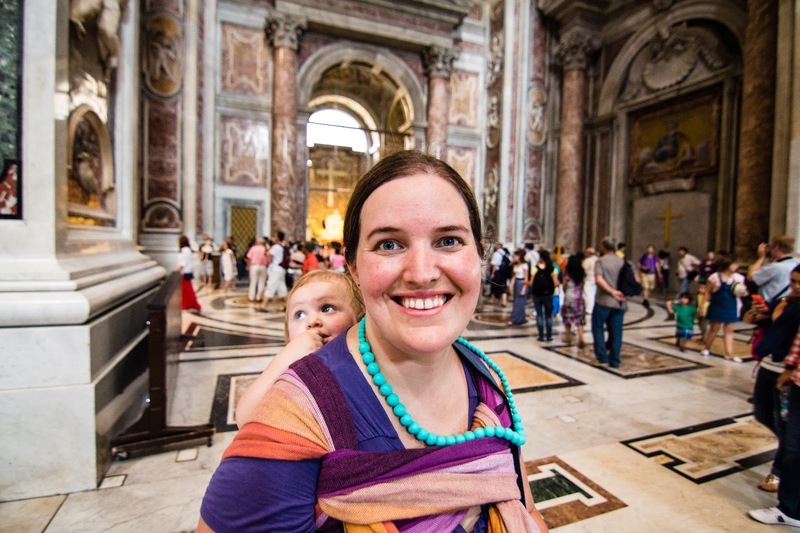 Lauren is an Advanced Babywearing Educator with Babywearing International of Phoenix. 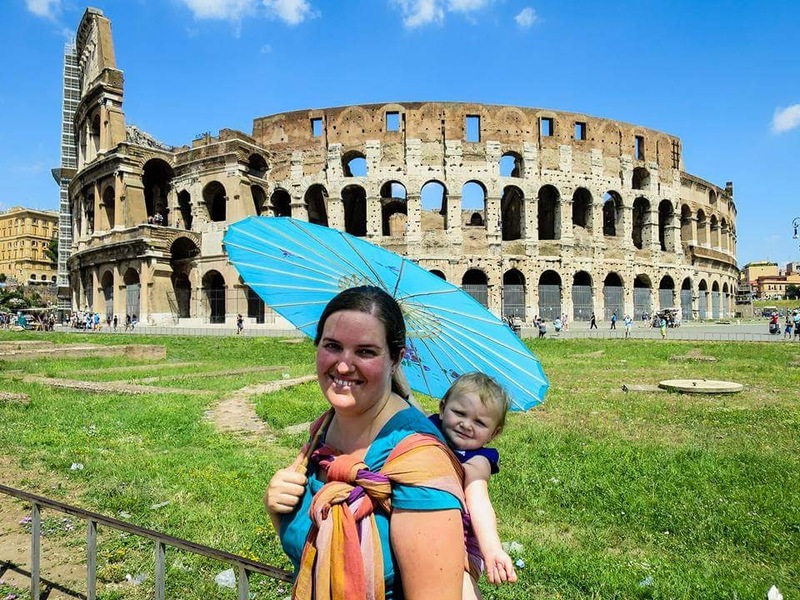 She loves trying out new carriers with her preschool aged daughter and newborn son, especially while traveling the world! Lauren regularly attends the weekend and central meetings. The perfect event starts with an extraordinary location. Whether you are dreaming of a grand entrance on a mountaintop vineyard estate, or an intimate gathering of family and friends at a seaside villa, good managers, like those at event venues Chicago are able to turn that dream into an extraordinary wedding.